We are engaged in offering our customers Custom Badge that is available in various patterns, lengths and thicknesses. Our badges are mainly used for making army, navy, airforce and other defence service garments. Apart from this, we check these badges on various parameters to ensure flawlessness. 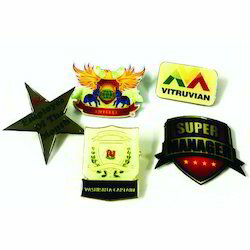 We are offering wide range of qualitative Promotional Badges. Our offered products are known for their unmatched quality.Moreover, these are highly appreciated among our clients due to their best finishing and excellent quality. We are a remarkable entity, engaged in exporting, trading and supplying a wide range of Customized Badges.